Tokyo, November 14, 2013 – Fuji Heavy Industries Ltd. (FHI), the manufacturer of Subaru automobiles, today announced that the "Legacy Concept" will make its world debut at the 2013 Los Angeles Auto Show (Press day: November 20 and 21; Open to public from November 22 through December 1, 2013). 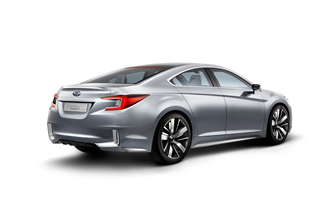 The concept model hints at the future design direction of Subaru's flagship Legacy model. It will be unveiled at the press briefing scheduled for 10:30 AM PST on November 20 at Subaru booth. The special site on the Subaru Global Site (http://www.subaru-global.com/2013la.html) will be updated with information relating to the Los Angeles Auto Show. This will include images of the Legacy Concept as well as Subaru's press conference. Since its birth in 1989, the Subaru Legacy has been praised the world over as Subaru's flagship model for its safety, dependability and driving performance, delivered by the combination of Subaru Boxer engine and Symmetrical AWD (S-AWD), Subaru's unique core technology. From its first appearance to the fifth generation, Subaru Legacy has delivered new technologies to the market while enhancing this progress with its stature as a sports sedan. The current generation Legacy, which debuted in 2009, grew in size and became a "global mid-size sedan" with its proven base performance with added space for practicality. 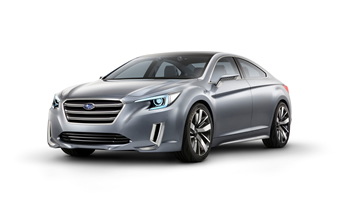 As 2014 marks the 25th anniversary of the Legacy, the Subaru Legacy Concept expresses the design direction of next generation Legacy mid-size sedan models. The dynamic and solid styling provide comfortable interior for all occupants with secure and reliable driving from S-AWD. They also embody Subaru's brand value of "driving enjoyment and peace of mind" that the brand is committed to offering its customers. Large wheels and bold fender flares express the stability and performance of S-AWD and the three-dimensional design clearly expresses high safety performance and dynamic driving. Also the athletic body with abundant space inside the cabin talks to the car's solid appearance and agile handling. In terms of exterior color, Subaru has adopted "Ocean Silver Metallic", a special color blend that consists of a light blue metallic silver with a metallic sheen and feel. This paint treatment further brings out the Legacy Concept's solid styling. The dynamic and solid appearance is created by a three-dimensional structure that starts at the Subaru's iconic hexagon front grille and continues to the whole body. The iconic grille was also employed for the SUBARU VIZIV CONCEPT, which was revealed at the 2013 Geneva motor show. The distinctive silhouette of head lamps and accessory lamps create advanced and aggressive fascia as a more unique brand's icon. While maintaining the cabin volume for a comfortable interior, a sleek side profile was created by a fast roofline and a flowing side window. The roofline consisting of front window, glass roof and rear window creates comfortable and exhilarating cabin. Also the solid door panel with the dynamic character line extending from the front all the way to the rear and almunum silver side sill garnish accentuates body surface, creating a lean silhouette. The simple and powerful fender combined with the large tires is one of the characteristic features of the car's styling. Also visually expresses the stability from S-AWD. The same design motif used on the front headlamp is applied to the rear combination lamp, creating an iconic look with a hexagonal design in both the front grille and the rear trunk. This emphasizes the depth and the dynamism of the overall style. The dual tailpipes built in the edge of rear bumper echoes vertically long shape from air intakes on the front bumper. At the bottom of rear bumper, rear diffuser and aluminum silver garnishes are employed aiming for both vehicle aerodynamics and design with a quality feel. The interior design also embodies dynamic and solid design. With plenty of room to carry four passengers, the interior is designed for high functionality. Quality leather in a brown base tone interior with blue accents achieves a high quality, yet sporty feel. The instrumental panel delivers a wide yet solid feel that conveys a sense of peace of mind to the driver. A multi function display is located at the center of the Instrument Panel that can be operated similarly to a smart phone or tablet. The large floor console from the front to the back of the cabin supports a convenient ride for the rear seat passengers by providing information display. Drivers will be welcomed by a sporty cylinder shape meter and 3-spoke steering wheel. Also its shifter is angled to align with the driver's seating position to inspire sporty driving feel to this concept car. In addition, the "EyeSight", Subaru's advanced driving assist system, is also equipped on the front edge of roof trim. By using head-up display which shows EyeSight's operation on the front window, an environment for drivers to focus on driving is provided. High quality and comfortable seats are placed in each four seating positions and are set well apart for ample seating space. These seats use a combination of air-conditioning function and breathable material to provide a comfortable environment for a long drive.